According to the Bradford Fire Department, a black GMC Envoy was being towed by an unknown salvage company when the SUV caught fire. The tow vehicle reportedly left the scene of the fire after disconnecting from the burning vehicle. BRADFORD — Authorities are questioning the cause of a Friday afternoon vehicle fire that started while a SUV was being towed behind a tow truck. 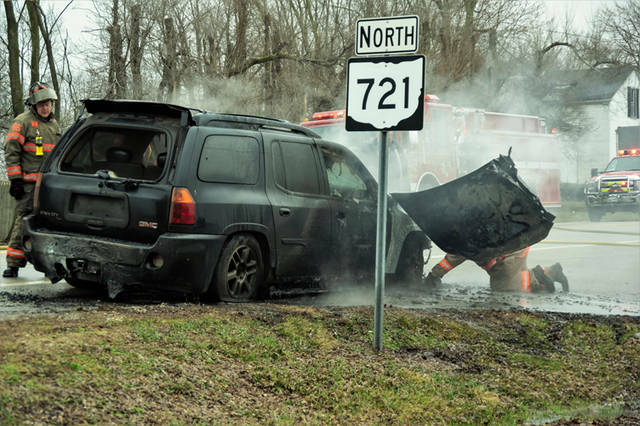 At approximately 2:55 p.m., emergency personnel from Bradford Fire and Rescue along with officer’s from the Ohio State Highway Patrol were dispatched to the area of U.S. Route 36 and State Route 721 to a vehicle fire. 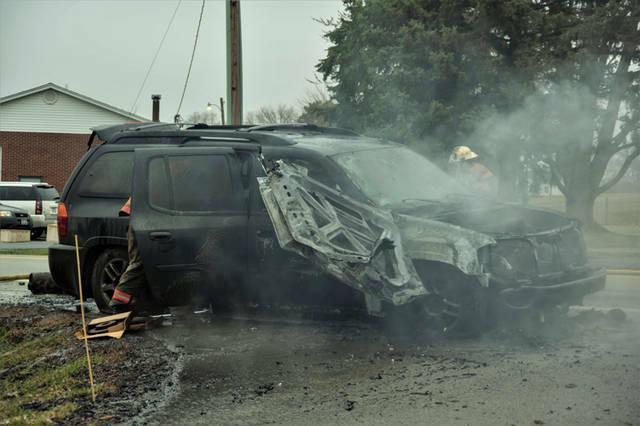 According to the Bradford Fire Department, a black GMC Envoy was being towed by an unknown salvage company when the driver of the truck pulling the SUV noticed smoke and flames coming from the vehicle. 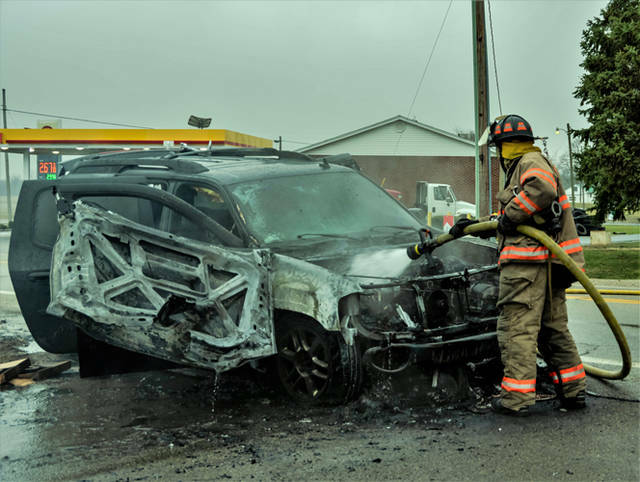 The driver of the tow vehicle was able to pull to the side of the roadway and disconnect from the burning vehicle before flames overtook the front of the GMC and eventually spread into the passenger compartment. The tow vehicle left the scene of the fire after disconnecting from the burning vehicle. Witnesses following behind the GMC said they could see something dragging and that sparks were coming from underneath the vehicle. State Route 721 was closed to both north and southbound traffic while the vehicle fire was extinguished and the wreckage was removed from the scene. The fire will remain under investigation by the Bradford Fire Department. This entry was tagged Bradford, Bradford Fire and Rescue, Bradford Fire Department, Bradford Rescue, fire, Ohio State Highway Patrol, State Highway Patrol. Bookmark the permalink.